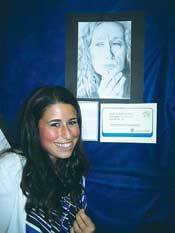 JERUSALEM ““ Jessica Borenstein of Teaneck won third prize for her pencil drawing, “Modern Matriarch,” in Yeshiva University’s third annual S. Daniel Abraham Program Art Competition for young women studying in Israel in the “gap year” between high school and college. More than 200 students from seminaries around Jerusalem came to YU’s Israel Campus auditorium for a dessert reception and exhibition of 29 contest entries last month. The annual competition aims to provide an opportunity for young women to foster their skills for expression in different visual media, within a Jewish framework. Entries had to connect to Jewish textual, cultural, or historical themes. The artists also submitted written statements explaining where and how they drew their inspiration. Borenstein, a 2009 Frisch School graduate, is studying at Emunah V’Omanut, a program that integrates Torah study with studio art and music. “I’ve always enjoyed art as a hobby, and I took one semester of art in high school,” said the young artist, the daughter of Carl and Miriam Borenstein. She explained to The Jewish Standard that even before learning of the competition, she had determined to draw her interpretation of a picture of an Israeli woman she had noticed in a periodical. In her explanation, Borenstein wrote that Israeli mothers who sacrifice for the sake of their families and for living in Israel reminded her of similar tribulations suffered by the biblical matriarchs. Young artists from Emunah V’Omanut, Midreshet Harova, Michlelet Mevasseret Yerushalayim, Michlalah, and Tiferet had submitted essays and photographs of their creations, which included paintings, sketches, collages, and three-dimensional media, to be judged by Susan Gardner and Traci Tullius of YU’s Stern College for Women. The art professors communicated with students throughout the creative process, helping them develop their work. At the reception, three Israeli artists ranked each piece, using such criteria as composition, use of color, technical skill, creativity, and expression of the theme. These judges included SCW graduate Hindy Strauss, who holds a master’s degree in fine art from City College; prize-winning Bezalel graduate Daniel Azoulay; and Marci Fishman Wiesel, who holds a degree in architecture and has developed a unique style of Judaic paper-cutting. The judges noted that this year’s entries showed a high level of sophistication, particularly in their concepts and technical expertise. The first-place award of $500 from SCW’s Sophie Freeman Art Enrichment Fund went to Mia Guttmann of Thornhill, Ontario, for her pencil depictions of “The Four Matriarchs.” Second-place honors went to Sara Noa Mark of Riverdale for her oil-on-wood piece entitled “Lech Lecha,” which uses an image of an Egged bus ticket to symbolize her journeys in the land of Israel. Two other students tied for third place with Borenstein: Elisha Katz of Plainview, N.Y., for her oil painting of the biblical Jephthe’s daughter weeping over the wedding dress of terror victim Nava Appelbaum, and Jessica Deutch of New Rochelle, N.Y., for her watercolor “Come Together.” All the winning entries will be displayed in the fall at SCW’s Beren Campus in midtown Manhattan. After Passover, Borenstein plans to spend the rest of the academic year at Kibbutz Sde Eliyahu before entering Cornell University.